Media and Contents: Soft cover; 40 pages plus covers;. Advantages: Great photo coverage across a broad range of subjects; helpful captions; well-presented format; includes rare colour photographs, emblems and awards plus four colour profiles; tie-in with associated decals (available separately). 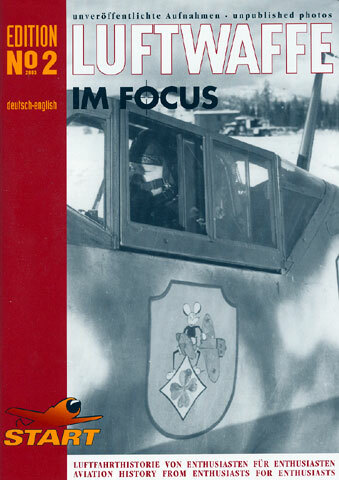 The second edition of Luftwaffe Im Focus continues with this series' excellent photographic coverage of Luftwaffe subjects from the Second World War. The book is presented in portrait A4 format, with a soft cover and 40 pages (plus covers). The paper is heavyweight and glossy. The publication is laid out attractively and professionally.. The uncluttered approach of Edition No.1 is carried on in this new volume. Once again, photos are large and well reproduced, and mostly presented as two to a page. Subjects including various (and very interesting) Bf 109s, Bf 110s, Ju 52, Fw 58, Ju 88s, Ju 87s and many, many more packed between the covers. Most of the aircraft in this issue are pictured in operational settings. Three excellent colour photos are supplemented by a new feature, four colour profiles. The subjects of these profiles are also covered in wartime photographs, and markings for some of these aircraft are available on a decal sheet from Start, sold separately. Perhaps the most interesting of these profile subjects are two Bf 109G-2s in a well defined mottle of winter whitewash over standard camouflage. The second of these Bf 109Gs is a Trop version wearing Mediterranean camouflage under its winter coat! Full text and captions are both provided in German and English. The captions are quite helpful, with details about units and locations where that information is available. 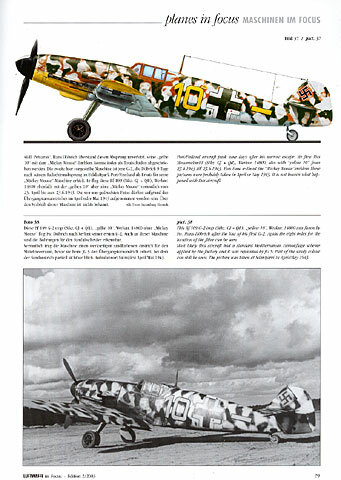 Luftwaffe fans will find plenty of interesting photos and information in Luftwaffe Im Focus Edition 2. The inclusion of profiles and the tie-in with decals are a welcome addition to an already attractive format. Whether your interest lies in Luftwaffe fighters, bombers or other aircraft types, Luftwaffe Im Focus will have something for you!